Today we are sharing a fantastically billowy and flavorful Fluffy White Frosting recipe, which is a seven minute frosting with a twist. This dreamy frosting is light and airy, like marshmallow cream, and has a sweetness that is not overpowering…it is pure heaven! If you are familiar with 7 minute frosting, this fluffy white frosting tastes identical, however the method is a little different. The traditional way to make seven minute frosting is to heat the ingredients over a double boiler as you mix. This recipe throws that method right out the window (yay), making it much simpler to make. When swirling my cupcakes with buttercream frosting, I usually keep the swirls low so that it isn’t too sweet or heavy. 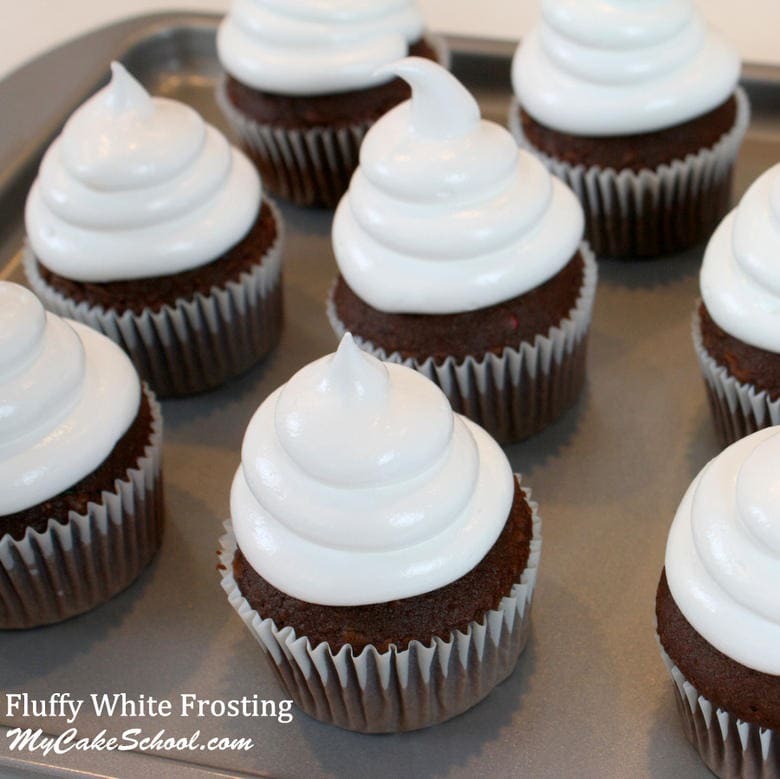 With this light Fluffy White Frosting recipe, I pipe my swirls to the ceiling! I can’t get enough of it, and it’s just so pretty too! This fluffy seven minute frosting is not only perfect for cakes, but it’s also perfect for cupcakes and high hat cupcakes too! In the video below, I’m making high hat cupcakes– you’ll see how I mixed up this fluffy white seven minute frosting recipe, as well as how to dip the cupcakes into chocolate for a WOW dessert! 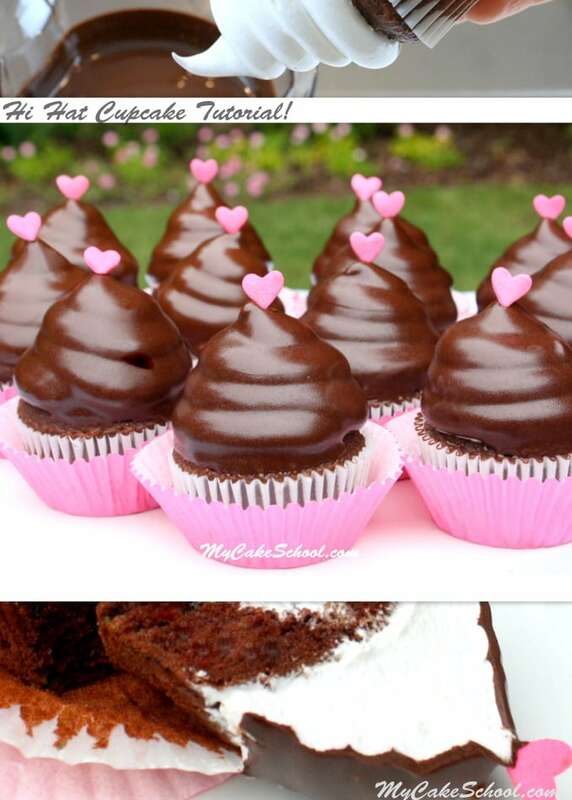 For more details on high hat cupcakes, you can find the link beneath our recipe below. Make sure that there is no trace of grease on your beaters or in your bowl before whipping your egg whites, or they will not whip up properly. After whipping up a batch of this frosting, you’ll want to use it soon as it will begin to set up. Do not apply to a warm cake as it may melt. The frosting may slightly deflate over time. To prepare this seven minute frosting, you can use a handheld mixer or a mixer with a whisk attachment. **This recipe makes about 5 cups of frosting, and can be easily doubled if you plan to do a lot of decorative piping or if you plan to swirl your cupcakes high! This light and billowy frosting has a wonderful marshmallow flavor. 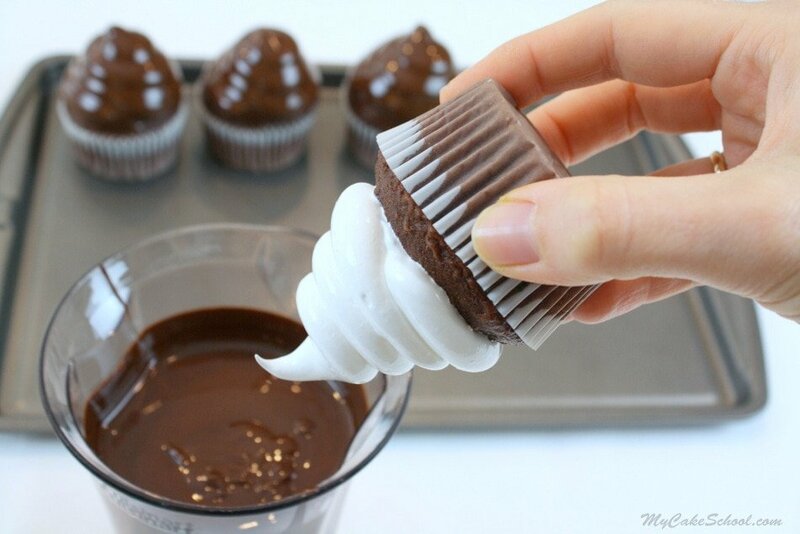 Perfect for frosting cakes and cupcakes! Make sure the mixing bowl and beaters are clean without a trace of grease. Any grease will keep the egg whites from increasing to full volume. Use a separate bowl to separate the eggs. You will be using only the whites and if a yolk happens to break and gets mixed in, the recipe will not work. Place the egg whites into the bowl of your mixer and add the vanilla. Set aside until time to beat the whites. In a saucepan, add the water, sugar, cream of tartar (or white corn syrup). Cook on medium/high heat. Do not stir, or stir just enough to distribute the sugar. You don’t want sugar crystals sticking to the sides of the pan. The mixture will begin to boil and become clear. After it boils for a minute or so, remove from the heat, you will be able to see that the sugar has dissolved. Beat the egg whites and vanilla to the soft peak stage. This happens rather quickly. At soft peak stage, the egg whites will not form peaks but will just fall over, cloud like. At this time, with the mixer beating on low speed slowly pour in a small stream of the hot sugar syrup into the egg whites. Avoid hitting the beaters as you pour because the hot syrup could splash onto you. Increase the mixer to high speed and beat approximately 7 minutes ( it could be longer if using a hand mixer) until stiff peaks form (stiff peaks stand straight up). The frosting should be used right away as it set up rather quickly. The frosting does not become hard but does form a slight crust. The cake can be kept at room temperature or refrigerated. Leftover frosting can be stored in the refrigerator and remixed, it will still taste good but will be softer and will not hold a stiff peak. Want to watch me whip up a batch of Fluffy White Frosting? In this quick Hi Hat Cupcake video tutorial, you can watch the entire process. Thanks for stopping by! We hope that you love this fluffy white frosting is much as we do! Luscious seven minute frostings are always a crowd pleaser! Don’t miss our full collection of FAVORITE cake and frosting recipes in our Recipes Section! If you are interested in learning more about cake decorating, make sure to check out our Free Cake Tutorials Section, which is filled with cute, creative, and simple cake & cupcake blog tutorials and videos! PI just made this. Oh, my gosh. It came out fabulous. I had my daughter taste it. She said it tastes like Lucky Charms. Well, of course it does. Just like marshmallow. I have never been the one to want to lick the beaters, but this recipe surely had me swiping them with my fingers. Yuuummmm. Don’t skimp on the beating time on the last step. I beat my frosting for a full seven minutes. When you mix the sugar in with the egg whites and vanilla, you might look at it and think, “Awww, it’s ruined”. No, just beat, beat, and beat it some more. You’ll be amazed how fluffy it gets. Definitely a keeper. Tip:. Stick a metal bowl in the freezer to chill while you cook the sugar, water and cream of tarter. Then take the bowl out add the eggs and vanilla and beat until your soft peaks form. Chilling the bowl helps a lot when beating egg whites. Hi, Id like to use this frosting for an outdoor event. Will this icing hold up in summer weather? Hi Hester, Yes, the frosting will hold up to summer event. We have another 7 minute frosting recipe that we plan to use to replace this recipe. It gives sharper peaks and holds up longer. We used it on the Chocolate Sour Cream Cake in the recipe section. I recommend that you use that recipe. The recipe on the Chocolate Sour Cream post has been doubled because Melissa was adding some decorative piping, so keep that in mind. The recipe is below, it makes 5 cups frosting, but as i said can be easily doubled. Let me know if you have other questions. Recipe can be doubled. If you plan to do any decorative piping as Melissa did on the Chocolate Sour Cream Cake, you will need to double the recipe. For those who are interested, this is called Italian Meringue and is the first half of a frosting called Italian Meringue Buttercream (IMBC). If you were to whip butter into this meringue recipe, you would have IMBC. Can you make this frosting ahead of time and put in the fridge? Like the day before? Thank you! Looks good! Hi Marie, This frosting should be made and used right away. It does not become hard but it does form a light crust, that is the reason for using soon after making. Leftover frosting can be refrigerated and remixed but it will be softer and will not hold a stiff peak when piped. You can frost your cake and refrigerate or store at room temperature for a day then refrigerate. You will need to double the recipe if you plan to use decorative piping as Melissa did on the Chocolate Sour Cream Cake. has anyone ever used this under fondant? Hi Marg- I wouldn’t recommend this for using under fondant, it is just too soft. I would go with a butter-based frosting or ganache so that you’ll have a firmer foundation for your fondant. I like to chill the frosting/ganache for about 10-15 min in the freezer until just firm before covering.